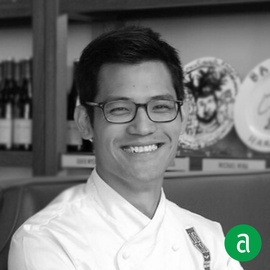 Nicholas Tang, Executive Chef at DBGB Kitchen & Bar in Washington, D.C., shares his career timeline and words of advice for up-and-coming professionals. "If it isn’t right, fix it, immediately!" My externship at Gidleigh Park, England had a huge impact on my career. I was amazed with the ingredients that came were delivered to us daily: venison that was shot by the farmer next to the restaurant, fish from day boat fishermen from Plymouth or Exmouth, and the vegetables from the farms down the road. It was one of my first experiences with ‘local produce’ and how you cook with the seasons. Multitasking, you must be able to master it. The kitchen, and restaurant, is a busy place and there are so many moving parts to the business that you need to know what’s happening where and when. You have to be able to react to different situations and come up with the solutions on the fly. I keep my team on their toes. Once you settle into a comfort zone, you are no longer progressing. You always need to find new and efficient ways to do things. When hiring, I look for cooks who have dedication and the willingness to learn. As a young cook, you need to be willing to get up early and go into work early to see what the baker does, what the pastry chef does, and learn how the butcher fillets fish or meat. Once your shift starts you don’t have time to learn all these so you need to sacrifice some sleep to build your culinary knowledge. I have a cup of hot tea the moment I step into the kitchen. It signals the start of the day!